As reported by the Wall Street Journal and Reuters, Amazon.com will begin to sell wine in a just few weeks here in the U.S. The announcement came from The Napa Valley Vintners association and not directly from Amazon. Also reported was that New Vine Logisitics will be Amazon’s shipping partner when they go live. Rumors have been circulating for some time that Amazon would enter the market but most observers thought they would concentrate on high volume brands. But the Amazon head wine buyer was on the floor checking out wines at the recent Family Winemakers of California and I have spoken with several smaller wineries who have been in discussions with them. As I posted back in March, I think his is the most signifiant development in wine distribution since the repeal of Prohibition in 1933. And Amazon’s actions in the past 6 months have validated my hypothesis that medium to small wineries are their target. Their decision to work with regional wine associations is a good one from an industry relations, recruitment and PR point of view. I don’t think it was an accident the announcement came from the Napa Valley Vintners and think we’ll see announcements from other winery associations before Amazon formally launches their wine business later this month or in early October. This is a great development for both wineries looking for online distribution and for consumers looking for small production, artisan wines. I expect the shipping fees to be reasonable like Amazon does for all their other products but their Prime service will be a must for serious wine lovers. For $79 a year, you get free shipping on all purchases with second day delivery. No word on if that speed will be honored for wine but if it’s just free ground shipping for wine, that will be huge for sales. With increasing fuel costs, shipping is becoming a real problem for wineries as it adds significantly to their customer price. If this is a non-issue, then wineries stand to benefit greatly from what Amazon if offering. This is not good news for other online wine retailers who do not have the deep pockets to cover the significant shipping costs or the economies of scale that Amazon has. But I still think there will be a place for niche e-tailers like domaine547 and wine marketing sites like woot and The Wine Spies. I think this is the biggest wine story of the year and will be blogging about what this means for wine marketing over at my company blog. 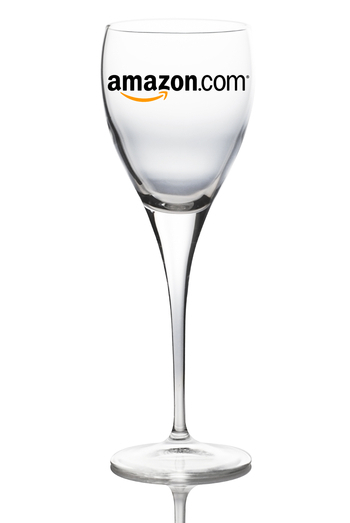 Cheers to Amazon and welcome to the wine business. I’d be very impressed if they could pull off two-day delivery to three-tier states! Last I heard there would be a two bottle minimum for Prime orders. I suspect that will not be a hardship for most buyers. Kurt: I’d be impressed if they did it in a week. Flat rate shipping is huge for online wine retailing. If they can ship to PA, then they’ll have *really* impressed me. If they can’t, I hope the somehow forge the right alliances to grind the PLCB into dust. Tim: That’s what they said at the time, but I wouldn’t be surprised to see them bump it to 3. The goal was 2 though. Dood: The goal is all 50 states. I don’t recall that PA is on the initial list, but they were adding states to the list since we first talked to them. Cross your fingers. Kurt: Since they are building their own “path” into each state they would have a lot of control. But I do hear what you are saying. The arrangements will probably be a lot like what Inertia is doing to build Direct to Trade paths into some states: a distributor that exists only to make the paperwork right. Thanks for the vote of confidence…when you figure out how the small specialty retailers (other than the one wine a day kind) can stay relevant and competitive, let me know! I really think this dramatic expansion of the online wine market can only be a good thing for freeing up interstate shipping constraints. Think what a huge injection of people concerned with the ‘Free the Grapes’ message/goals, motivated by Amazon, could do for the entire online wine market. That’s a blog post in and of itself Tim! Kurt: Only US for now because that is a useful simplification. And yes NVL is part of building the path into each state. Jill: The number one path for me will always be direct to consumer. But you knew that already. And you also know that the way you stay relevant and competitive is by being Jill: bringing your unique perspective to your loyal customers (people like me!). What I as a winery get from Amazon is another way to get visible – but I won’t be selling my limited availability stuff there. BTW, just received notification from NVL that they are expanding their fulfillment center operations to 7 days a week. No doubt in anticipation of many Amazon-originating orders. Good for us as NVL customers as well! I love when brand cross-promotion works well. Amazon.com’s benefits will help wineries reach the consumer more effectively, in turn, Amazon.com will be pulling on more wine-geared consumers thanks to the wineries. It’s these kind of partnerships that actually get me excited about the potential for everyone involved. This sounds like a great opportunity for smaller wine vendors to get out in the open. It’ll be interesting to see how this turns out. Can anyone tell me who the head buyer at Amazon is? Or his/her identity a secret?